Next→Travel Guitars Reviewed: What Guitar is Best for Travel? If so, you’ve probably wondered, how can I learn to play the guitar and sing at the same time? If you’re reading this, chances are that you have not yet mastered either playing the guitar or singing. So even though you may be starting to feel confident that you can sing the lines to a song, or that you can play the chords, your lack of total mastery becomes apparent when you try to combine both together. Only by mastering a skill can you combine it with other skills. It is fairly common for beginners to struggle with this challenge, so let’s break it down. How can I juggle oranges while shaking hands with a monkey? You’ve got a few problems. Do you have enough oranges? Where are you going to get this monkey from? And do you even juggle? To get coordinated enough to do several different tasks at once, you’ve got to use the right approach for the problem. You’ve got to break things down into the smallest pieces, practice the pieces until they are perfect, and then try putting those pieces together. For this challenge, there are roughly three pieces. Let’s look at the limiting factors that you can take off of your list in order to get you closer to your goal. Musical performance demands total mastery. Even if you can sing the lyrics and the melody and you think you’ve got it down, it’s still taking some of your concentration. Let’s suppose it’s taking 60% of your attention to sing. You have enough mental resources remaining to wash the dishes or write legislation, but not enough to do something difficult like playing the guitar. Now, if you can play the guitar part with 60% concentration, too, the sum of these parts demands 120% of your concentration. That means you can’t do it. It falls apart or at least sounds sloppy. 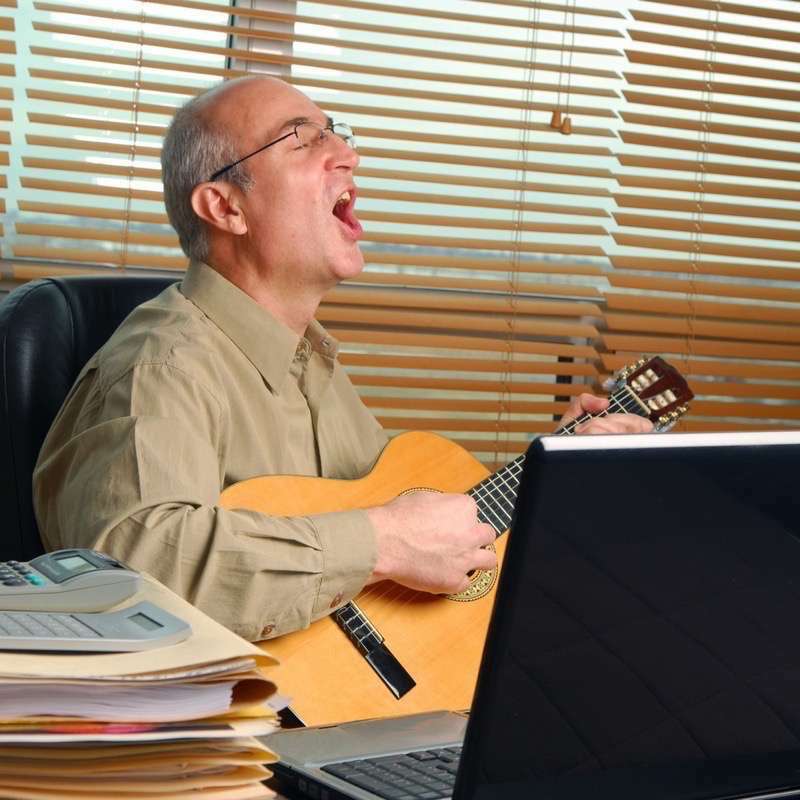 Even though you feel able to sing and able to play the guitar, you can’t do both together until each of them is so easy that it demands less than half of your concentration—and even then, you’ll be dangerously close to your threshold. You’ve seen many performers sing and play at the same time. Must be easy for them, right? Well, it’s very difficult for them, too, and they are using all of their concentration. Is the lyric memorized? If its not, it’s robbing you of attention. Learn to recite the lyrics from memory with no hesitation. Sound boring? No kidding, but if you want to take your music to the next level you need to invest a little time in this. Close the book and say the lyrics out loud until they’re memorized. Memorize each verse or chorus section separately. Tip: try to remember the first word of each line. This will help you recall the lyrics. Do you really know the melody? You need to be able to sing the melody from memory. That includes any vocal effects or color you like to add; any special notes or highlights. This all has to come completely naturally. Repetition helps. Is the song in the right key for you? Professional singers change the key of music all the time. It’s a given. Why should a learner expect he or she should always sing in the key on the studio recorded version? The highest and lowest notes should be comfortable for you to reach. You should be able to hit them 100% of the time. If you can’t, change the key or change the problem notes. Studio albums are often recorded in a key that the artist doesn’t dare use live. Don’t be afraid to change the key. Sing along with the recording. You should sing along with the recording until you can do so without concentrating at all, and you feel confident in the result. Sing it a cappellaA style of singing with no non-vocal accompaniment. A cappella music features only human voices and no other element.. Now you have no reference to follow, and this is a good test of whether you’ve memorized the tune. It’s best to use a metronome for this. Sing with a karaoke track. You can find a karaoke track on YouTube for many popular songs. Try singing along. If one is not available, you can record the guitar chords yourself and sing along. Memorize the chords. If you’re looking at a piece of paper, you’re burning your attention resources. Master the chord switches. Practice rapidly switching between chords until you can do it quickly and effortlessly, using a technique such as chord pushups. Perfect the rhythm. Practice the rhythm part with a metronome until you can play it in time. There’s nothing wrong with changing the rhythm part to suit your guitar playing level or other preferences. But you’ve got to have good time. Before mastering these individual pieces, they were sources of difficulty, not sources of strength. You were liable to forget a line, drop a beat, or lose track of which chord comes next. But once you master them, they become pillars of strength. Now, your memory of the lyric is aided by your effortless recall of the chord. When your rhythm weakens a little, your ability to easily remember the chords helps you to pick up the slack. This is the effect of taking a tune apart and mastering all of the little pieces. Now you’re ready to put them together. Play the full rhythm part, while speaking the lyrics. Taking some pressure off of your singing will help you learn where the words are placed without worrying about actually singing them. Play block chordsA simplified accompaniment consisting of one chord per chord change. The chords are just played once as they occur and allowed to fade away. and sing the full lyric with melody. Hum the melody, with no lyric, while playing the accompaniment. Put everything together. If it’s still sloppy, repeat the process until it smooths out. There is no such thing as playing the guitar. There is no such thing as playing and singing the guitar. These are words we made up to describe many events all happening at once. Playing the guitar requires your fingers to be in a certain position on the neck, it requires your other hand to move with a particular motion and rhythm. This is actually not one task, but many. Dividing the tasks into those smaller parts will help you to achieve higher levels of proficiency. Next articles lesson: Travel Guitars Reviewed: What Guitar is Best for Travel?